Mumbai: The Centre has drafted a plan to urgently deploy rapid action units of the National Security Guard (NSG) in six or seven cities, including Mumbai. Until the state units are created, it is proposed to utilise personnel of commando units of the three armed forces in the states. Though a Cabinet note for NSG “decentralization” was ready weeks before the Mumbai attack, the proposal is being amended following the high-level meeting chaired by the Prime Minister yesterday. Cabinet Secretary K M Chandrasekhar, who attended the meeting, told The Indian Express that the NSG’s state expansion plan, augmentation of coastal security, creation of a federal investigation agency and steps to be taken to improve security in hotels were among the subjects discussed at the meeting. National Security Advisor M K Narayanan, Principal Secretary T K A Nair, Home Secretary Madhukar Gupta and the Defence chiefs also attended the meeting. “For the next one week, I will be postponing most other scheduled meetings to give final shape to proposals on all these subjects,” Chandrasekhar said. Home Secretary Madhukar Gupta told The Indian Express that a review has been undertaken on creation of a third-tier of coastal security, in addition to the Navy and Coast Guards. The current plan envisages provision of a fleet of 208 new patrolling boats to sensitive coastal states, including Gujarat and Maharashtra. Gupta said a process was being coordinated with the Ministry of Defence for purchase of three new aircraft by the Home Ministry — these will be used by paramilitary forces, including the NSG, for emergencies such as the Mumbai attacks. These proposals are significant considering that the NSG has long demanded its own air-wing and a lot of time was taken to fly in commandos to Mumbai. The NSG, incidentally, has over 300 vacant posts. He said he has been holding detailed reviews with state governments on a 2006 proposal for a third tier of coastal security which includes creation of 73 new coastal police stations. The scheme is expected to be fully implemented by 2009. Rediff article on the op strategy of NSG for the Op Black Tornado. Indian counter-terrorist forces were well trained but failed to gather sufficient intelligence before engaging the terrorists, they said. "In this case, it appears that the forces showed up at the scene and immediately began exchanging fire with the terrorists instead of first taking control of the area," he said. read the first post AND the thread title. Last edited by Rahul M on 01 Dec 2008 23:36, edited 1 time in total. NEW DELHI: As he laughs heartily, exchanges jokes with his colleagues and chats about his family, it is difficult to imagine that this National Security Guard commando was involved in the anti-terrorist operations in Mumbai till about a day ago. However, a bruise on his left ear indicated that this officer was in the thick of things. “A bullet fired by a terrorist brushed past my ear,” he says nonchalantly, playing down the consequences if the bullet had been two inches to the right. Despite a gruelling counter-offensive operation against the terrorists holed up at three different places in Mumbai, the commandos of the elite force who returned from that city to the Capital in two batches on Saturday night and Sunday afternoon showed little signs of fatigue. Talking to reporters, Colonel Sunil Sheoran, a highly decorated officer and the group commander of the 51 SAG (Special Action Group), said their first priority was to take the guests out and then neutralise the militants. He mentioned how all three places – Taj Mahal Hotel, Oberoi-Trident Hotel and Nariman House – had their own “peculiarities and difficulties”. A commando who was involved in the operations at the Oberoi Hotel said the team went inside the building from a route not covered by the media. “After a few rounds, he limped back as he was hit by us and took shelter in a dark place and we cornered him. We were operating in back-up power. We were careful not to let him slip out at night. We engaged him till the first light next morning and then shot him after knowing his exact location,” the officer said. The second terrorist who was lodged in room number 1856 was also killed by morning. Some commandos revealed that what delayed the operation even after the militants were killed was that people inside the rooms did not respond even when the NSG group knocked on the door to check. “People inside were cautious and despite our pleas they would not come out. The hotel staff tried calling the internal phones, but the guests did not take the call. We could not make any central announcement, as we were not sure if there were only two terrorists in the building,” he added. The team that flushed the militants at the Oberoi-Trident said the hotel staff, particularly a security officer, was of immense help during the 30-hour operation. Last edited by Jagan on 02 Dec 2008 09:06, edited 1 time in total. Some additional details about the NSG op. in the Taj. "J. K. Dutt, the director general of India’s National Security Guards, the commando force that took the lead in the fighting, said Sunday in a televised news conference that the most difficult gunman to attack in the Taj hotel was one who ascended a spiral staircase and took up a position behind an extremely thick pillar that was part of the 105-year-old building’s original structure. Particularly at the Taj, the attackers seemed to have detailed knowledge of the building’s layout, Mr. Dutt said. They kept moving among large halls with multiple entrances, not allowing themselves to be cornered in small rooms without other exits. By contrast, the commandos and the police had old blueprints of the massive, labyrinthine hotel that did not clearly show which passageways were connected and which were blocked by walls, and did not show recent construction, Mr. Dutt said." Last edited by Jagan on 02 Dec 2008 09:07, edited 1 time in total. 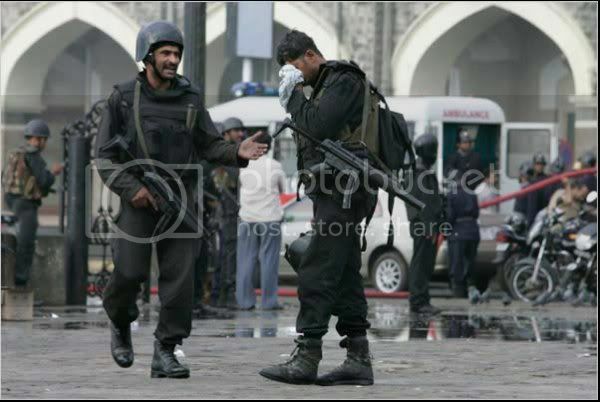 One of India's elite 'Black Cat' commandos has told Sky News how he was wounded in the Mumbai attacks. Sunil Kumar was shot three times in the back as he dragged a wounded victim in the Taj Mahal palace hotel to safety. I don't know if sky will archive this vid or not. could some member download it and upload it on youtube ? Whenever I think God has stopped making men like these....I always realize that He has not stopped, for this is the Indian Soldier. I knew two people who were caught up in the Mumbai Terrorist Attacks - one was a hostage and she did not make it, the other from IN participated in the Oberoi/Trident ops and he made it. Just as a matter of record, based on piecing together from different news sources, I reconstructed the following encounter surrounding Major Unnikrishnan's death (please correct me if I am wrong though!). Sunil Kumar was wounded in the incident where Major Unnikrishnan was killed. The other commando Ranjit Lamba was also wounded but is in stable condition. ~14 member total, clearing floors in top down fashion. Major Unnikrishnan was team commander, Ranjit Lamba was first through the door. He saw a guy seemingly unarmed and challenged him (I dont think they had been ordered to capture the terrorists alive but the presence of hostages behind locked rooms might have led them to hold off on shooting). Another guy came from behind and shot Lamba in the hand (and possibly the hotel employee being mentioned), Lamba fired back and during the ensuing crossfire, Major Unni got killed and Sunil Kumar was wounded. Both terrorists perished in the incident. Thereafter the other team quickly moved to another room close by and breached the door with a charge but due to excessive amount of explosives used, Lamba got a burn on his face (from pics on rediff does not seem to be a very serious one) and lost consciousness. Major Unni was not KIA but was WIA..his body was collected by ambulance attendant who were provided BPJs and escorted by NSG commandos to 3rd floor amidst firing from terrorists. Major Unni died of wounds, in hospital later, he was 31 and unmarried. The info I dont have is where was the Major hit/cause of death. Unfortunately Gajendar Singh (who was on deputation to NSG from 10Para Cdo) has not received too much publicity....only thing I know is he died of splinter injuries when grenade was thrown at him and he was leading the assault. Is that laser spot on the MP5? Last edited by Nikhil T on 02 Dec 2008 22:43, edited 1 time in total. Some more articles (Rediff, Hindu etc.) on how NSG fight and some of their hitherto unknown equipments. Previously B-R has had articles from Rediff (usually Varsha Bhosle) which have been reproduced in the Army section. Is it possible for any B-R adminullahs to obtain copyright permission so that we may archive these articles and those tons of pics and NSG/MARCO interview videos on B-R...it will really expand the Special Forces section which has been stagnant for a while. This operation has been a treasure trove of info on the NSG and even the secretive MARCOS. I can definitely help with revamping that section if adminullahs think fit. Last edited by Raja Bose on 03 Dec 2008 08:22, edited 1 time in total. not the Q&A thread. use the small arms or the special forces thread. Last edited by Rahul M on 03 Dec 2008 09:27, edited 1 time in total. The Wiki link mentions Hooligan as a variant of Halligan. 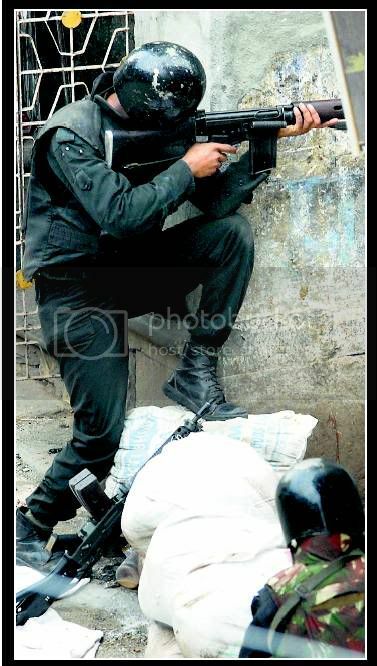 Another NSG article (Rediff) - shows the tough mindset of the commandos. "That's not our policy -- to leave the enemy alive," Arutselvam of the National Security Guard said as he emerged from Nariman House in Colaba, south Mumbai, at 1030 pm, after the long security operation against the terrorists who had taken over the Jewish centre. He was calm and looked relaxed. The fatigue of working for 18 hours had not taken its toll. At least, it did not show. The NSG commandos arrived at Nariman House directly from the airport and were not planning to return to their headquarters near New Delhi [Images]. "Some of us are going to the Taj to help, the others will wait. We don't know where these terrorists will turn up next." The commandos got into the buses and nonchalantly started chatting amongst themselves. The crowds outside the buses went berserk. Some cheered, others clapped. "Bharat Mata Ki Jai," screamed the crowd. Two-and-a-half hours earlier, at 8 pm, the situation was different. Sporadic gunfire could be heard from Nariman House. Explosions rocked the area at frequent intervals. The crowds and television crews were being kept at a distance. Shamu Begum and her four children lives down the lane from Nariman House. "My kids have to go for tuitions in the building next to Nariman House. I haven't allowed them to go for the last two days. We were initially scared. While Mumbai has seen frequent bomb blasts, Colaba has always been safe. There are so many foreigners here. It is a tourist area. So security is high here. I have never seen anything like this. I was scared about my kids. But that was the day before yesterday. After the commandos came I am not scared. I know that they came here alive. But the terrorists will leave here dead. Our commandos will kill them." Raju also lives in the same lane. "They (the terrorists) landed near Badhwar Park (an area close to Nariman House) and ran down this lane. They first shot a young boy and then hurled a grenade at the petrol pump. Luckily, nothing happened to the pump. If the grenade had exploded, the whole area would have been devastated." Once the terrorists entered Nariman House the locals did not know what to do, and waited for the Mumbai police to do something. But the fact that Israelis were held hostage, it had to be the NSG commandos who did the job. "We are sad for the families who lost their lives," one NSG officer said as the commandos left the site. "Those ******** killed them. We are also sorry that we had to destroy most of the building, we had no choice. But we did not spare them." After the NSG teams left, the Mumbai police took over the site. The bomb disposal squad and its sniffer dogs entered Nariman House to make sure that no bombs lurked there. "They will find a few grenades," Arutselvam told us. "The Jews used to feed the poor who came there," Raju said. "They were nice people." Halligan is the original equipment. Modded equipments (such as those used by NSG) commonly called Hooligan so article is correct. 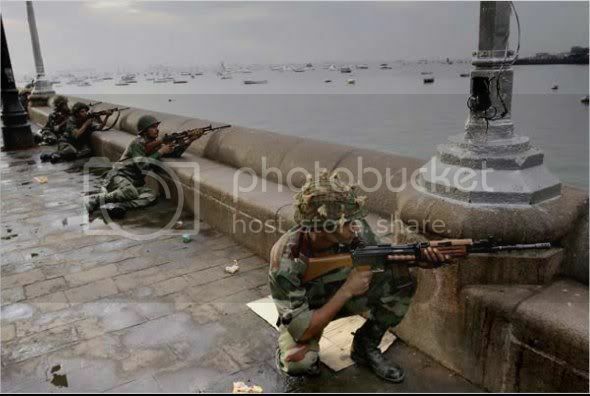 Mumbai: The high motivation levels of the terrorists, who laid siege to the Taj Mahal hotel, prolonged the fierce gun battle for about 60 hours, said National Security Guard (NSG) commandos, who participated in the operation. “The terrorists were trained but not as good as we were. But what really prolonged the entire operation was that they were highly motivated and never bothered about their lives and even if they did, it was only to take more lives,” havildar Azad Singh, a commando, said. Mr. Singh, who had been at the hotel for the entire duration and was also involved in a dramatic shootout with two terrorists on Saturday, said the operation was hampered because of darkness as the lights were destroyed by the terrorists. After a few seconds of the blast, the terrorists fired yet again making the commandos answer with double firepower. “I was asked to move ahead and I did so by firing continuously. Inside the room was a terrorist who had got shot and he staggered behind and hit the window. I sensed an opportunity and fired at him and he fell out because of the shots,” he added. He said the terrorists had intentionally set on fire certain portions of the hotel to divert attention. “Our top officers were present throughout the operation. It is a combined effort of the NSG, the Army and the Navy,” he added. Dehradun: The tiny village of Ganeshpur turned out in full strength to bid adieu to its hero, Havaldar Gajendra Singh Bisht (36), the National Security Guards (NSG) commando who died fighting terrorists in Mumbai. Havaldar Gajendra’s mortal remains were consigned to the flames with full military honours on Saturday afternoon with more than a thousand people from Ganeshpur and its adjoining villages participating in the funeral. “He had always wanted to be in the forces and had always wanted to die like a hero. And that is precisely what happened,” said his brother, Birender Singh Bisht, an official in the Uttarakhand Police. Amongst those present to pay their respects to the martyr was his teacher from Janata Inter College in Naya Gaon Subhash Chand Jasola. “He had studied in the college from 1980 to 1990. I cannot forget his interest in sports, particularly boxing. He was a disciplined student and participated in every event organised in the school, be it sports or cultural activities,” said Jasola, who teaches English at the college. He said that Havaldar Gajendra is the third student from the college to have died for the country in military operations. Earlier, two of his former students had died during the Kargil operations. Havaldar Gajendra had also participated in the Kargil operations. The college was shut for the day in honour of Havaldar Gajendra’s sacrifice and the entire staff and students had turned up for his funeral. “I met him last in August when our father Late Daulat Singh had died. Thereafter, we had been in touch on phone,” said his brother. He said Gajendra joined the Garhwal Rifles in 1991 and then chose to be part of the 10 Para (Special Force). Thereafter, he had opted to be a NSG commando. He was based in Delhi when he was asked to be part of Mumbai operation. “After having dinner on November 26, he got a call from his office saying that an alert has been sounded. He had left the house carrying bare essentials, telling me that he would be back in a while. It was a couple of hours later that we were told that he had been sent to Mumbai,” said his wife Vineeta Devi (31). She said her husband wanted their daughter Preeti (10) to be an air hostess and son Gaurav (12) to be an Army officer. “I wonder where we are faltering in dealing with terrorism. We have the best of forces and technology. We need to ponder why innocents are losing their lives while those compromising with their duties are making millions,” said the deceased’s maternal uncle Dr Hoshiar Singh Negi. Uttarakhand Governor B.L. Joshi, Chief Minister B.C. Khanduri and IMA Commandant Lt Gen R.S. Sujlana paid a visit to Havaldar Gajendra’s house to offer their condolences to his family. In his address, Joshi said, “As the Governor of the state, I am proud of the supreme sacrifice made by Havaldar Gajendra. At the same time, I am also very sad at his untimely death. The whole nation is with his family at this hour of grief.” Khanduri announced an immediate aid of Rs 5 lakh to the family of Havaldar Ganjendra. Last edited by Rahul M on 03 Dec 2008 18:23, edited 1 time in total. 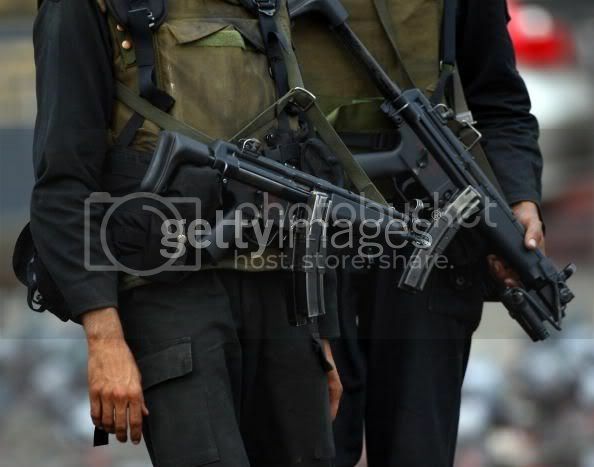 Thats TOPS security, one of India's largest security agency. Nice to see one of my articles here. Unni was a term junior to me in NDA. It was a huge shock. Terrific chap. Almost too nice to be a commando, but don't doubt his courage or ruthlesslness. Dear Unni, RIP. Here is the link for another story. pmund wrote: Nice to see one of my articles here. Unni was a term junior to me in NDA. It was a huge shock. Terrific chap. Almost too nice to be a commando, but don't doubt his courage or ruthlesslness. Dear Unni, RIP. Welcome. Please convey our regards to his family and all others in service. Which one is your article can you please indicate. If you are in touch with the Major Unnikrishnan's family, please pass on our respects to them. It was heartbreaking to see what his parents had to go through, that too in the glare of publcity of our insensitive media and disgusting so-called leaders.